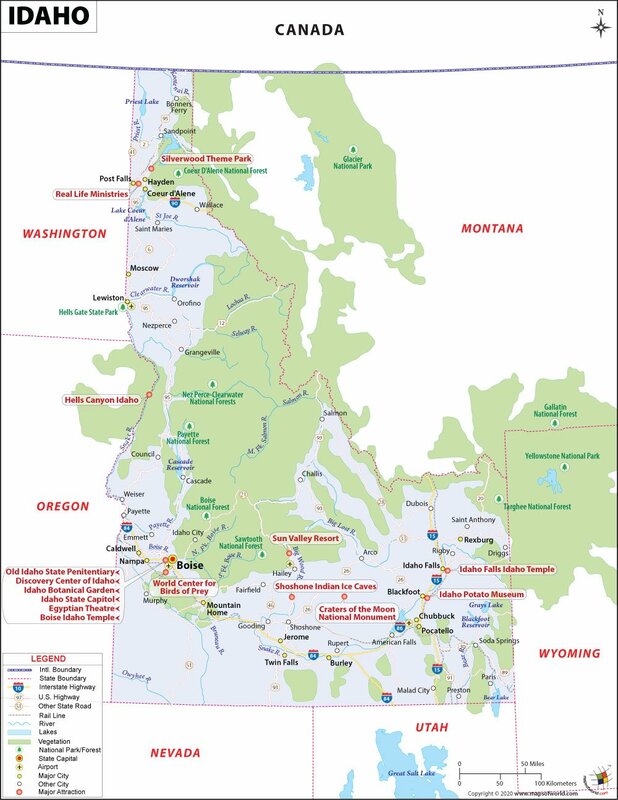 Explore the map of Idaho: Located in the northwestern United States, Idaho (ID) is bordered by Washington and Oregon on the west and Montana and Wyoming on the east. It shares its international border with Canada in the north and the US states of Nevada and Utah in the south. It is the 14th most extensive, the 39th most populous, and the seventh least densely populated of the fifty states of USA. : Get to know more about Idaho by referring to this highly accurate map of the state. The map comes loaded with information about the tourist places, points of interest, airport and rail services, national parks, museums, among others. It is highly beneficial for travelers, students, teachers and researchers. The official flag of Idaho has a seal of the State on the blue color background. Below the Seal, there is a red and gold band that has "State of Idaho" written on it in gold letters. Located in the northwestern region of the country, Idaho is the 14th largest state in the United States. With an estimated population of 1,634,464, Idaho is the 39th most populous state in the country. Boise is the capital as well as the largest city of Idaho. Comprising 44 counties, Idaho is also known by its nickname the 'Gem State'. Humans seem to have inhabited the area since 14,500 years ago. But prior to the arrival of the Europeans, Native American Tribes were the dominant people in the area. In modern times, both the United States and Great Britain laid claim to Idaho, which was a part of the Oregon Country; however, in 1846, the United States was successful in gaining undisputed jurisdiction over the area. With Oregon becoming a state, Idaho remained in the original Oregon Territory. On March 4, 1863, the Idaho Territory was created. In 1865, Boise became the capital of Idaho. On July 3, 1890, Idaho became the 43rd state of the United States. Idaho covers an area of 83,570 square miles. To its northeast is located the state of Montana and to the east is Wyoming. The two states of Nevada and Utah are located to the south while Washington and Oregon are located to the west. To the north of Idaho lies the Canadian province of British Columbia. Since Idaho is a Rocky Mountain state, its landscape is basically rugged. Some important rivers of Idaho are Clearwater River, Snake River, Salmon River, and the Clark Fork/Pend Oreille River. With a height of 12,662 feet, Borah Peak is the highest point in the state. Some prominent mountain ranges in Idaho are Sawtooth Range, White Cloud Mountains, Salmon River Mountains, Bitterroot Range, Clearwater Mountains, among others. The Sun Valley Resort is popular among skiing enthusiasts, while the Sawtooth National Recreation Area is popular for its hiking and horseback riding trails as well as the opportunities it provides in the fields of snowmobiling and cross-country skiing. Hell's Canyon is a popular tourist destination and the deepest gorge in North America. Other than this, visitors can also take a trip to Shoshone Indian Ice Caves, Old Idaho Penitentiary State Historic Site, Lake Coeur d'Alene and other such wonderful attractions. Boise Airport and Spokane International Airport are two important airports in Idaho. Some prominent rail service that cross through the state are Burlington Northern Santa Fe, Union Pacific Railroad, Canadian Pacific Railway and Amtrak's Empire Builder. Some important interstate highways are US Route 95, I-84, I-86 and I-15. The University of Idaho, which was founded in the Idaho city of Moscow in 1889, is the oldest university in the state. Some other reputed universities in the state are Boise State University and Idaho State University. Idaho is at times called the 'Potato State'. After English, Spanish is the second most spoken language in the state.